François Rabelais (c. 1494 - April 9, 1553) was a major French Renaissance writer, doctor, and humanist. He is regarded as an avant-garde writer of fantasy, satire, the grotesque, dirty jokes, bawdy songs, and anarchism. His work was highly original, in both subject matter and quality. While his stories were considered shocking, the playful use of language belies an almost modern sensibility, as does his storytelling ability with its use of monologue and dialogue. Although the place (or date) of his birth is not reliably documented, it is probable that François Rabelais was born in 1494, near Chinon, Indre-et-Loire, where his father worked as a lawyer and his mother was a homemaker. It is believed that he, too, studied law, but left it to join a Franciscan order, taking vows by or before 1521. Later, he left the monastery to study at the University of Poitiers and University of Montpellier. After leaving the Franciscans, he joined the Benedictines, probably studying medicine with them. In 1532, he moved to Lyon, one of the intellectual centers of France, where he was a physician at the hospital, the Hôtel-Dieu. He not only practiced medicine, but edited Latin works for the printer Sebastian Gryphius. As a doctor, he used his spare time to write and publish humorous pamphlets which were critical of established authority and stressed his own perception of individual liberty. His revolutionary works, although satirical, revealed an astute observer of the social and political events unfolding during the first half of the sixteenth century. After the publication of his great literary works, Rabelais traveled frequently to Rome with du Bellay and lived for a short time in Turin with du Bellay's brother, Guillaume, during which François I was his patron. Rabelais probably spent some time in hiding, threatened by being labeled a heretic. Only the protection of du Bellay saved Rabelais after the condemnation of his novel by the Sorbonne. 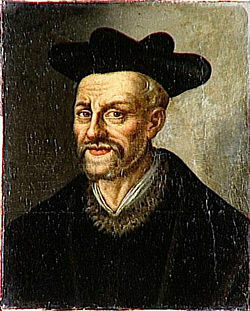 Rabelais later taught medicine at Montpellier in 1537 and 1538, and, in 1547, became curate of Saint-Christophe-du-Jambet and of Meudon, from which he resigned before his death in Paris, in 1553. There are diverging accounts of Rabelais' death and his last words. According to some, he wrote a famous one-sentence will: "I have nothing, I owe a great deal, and the rest I leave to the poor," and his last words were "I am off in search of a great perhaps." Using the pseudonym Alcofribas Nasier (an anagram of François Rabelais minus the cedilla on the c), in 1532, he published his first book, Pantagruel, that would be the start of his Gargantua series (see Gargantua and Pantagruel). In his book, Rabelais sings the praises of the wines from his hometown of Chinon through vivid descriptions of the "eat, drink, and be merry" lifestyle of the main character, the giant Pantagruel, and his friends. Despite the great popularity of his book, both it and his prequel book on the life of Pantagruel's father Gargantua were condemned by the academics at the Sorbonne for their unorthodox ideas and by the Roman Catholic Church for its derision of certain religious practices. Rabelais's third book, published under his own name, was also banned. With support from members of the prominent du Bellay family (esp. Jean du Bellay), Rabelais received the approval from King François I to continue to publish his collection. However, after the death of the enlightened king, Rabelais was frowned upon by the academic elite, and the French Parliament suspended the sale of his fourth book. They tell the story of two giants—a father, Gargantua, and his son, Pantagruel—and their adventures, written in an amusing, extravagant, and satirical vein. While the first two books focus on the lives of the two giants, the rest of the series is mostly devoted to the adventures of Pantagruel's friends—such as Panurge, a roguish erudite maverick, and Brother Jean, a bold, voracious and boozing ex-monk—and others on a collective naval journey in search of the Divine Bottle. Even though most chapters are humorous, wildly fantastic, and sometimes absurd, a few relatively serious passages have become famous for descriptions of humanistic ideals of the time. In particular, the letter of Gargantua to Pantagruel and the chapters on Gargantua's boyhood present a rather detailed vision of education. It is in the first book where Rabelais writes of the Abbey of Theleme, built by the giant Gargantua. It pokes fun at the monastic institutions, since his abbey has a swimming pool, maid service, and no clocks in sight. The French Renaissance was a time of linguistic controversies. Among the issues that were debated by scholars was the question of the origin of language. What was the first language? Is language something that all humans are born with or something that they learn (nature versus nurture)? Is there some sort of connection between words and the objects they refer to, or are words purely arbitrary? Rabelais deals with these matters, among many others, in his books. The early sixteenth century was also a time of innovations and change for the French language, especially in its written form. The first grammar was published in 1530, followed nine years later by the first dictionary. Since spelling was far less codified than it is now, each author used their own orthography. Rabelais himself developed his personal set of rather complex rules. He was a supporter of etymological spelling; for example, one that reflects the origin of words, and was thus opposed to those who favored a simplified spelling, one that reflects the actual pronunciation of words. Rabelais' use of his native tongue was astoundingly original, lively, and creative. He introduced dozens of Greek, Latin, and Italian loan-words and direct translations of Greek and Latin compound words and idioms into French. He also used many dialectal forms and invented new words and metaphors, some of which have become part of the standard language and are still used today. Rabelais is arguably one of the authors who has enriched the French language in the most significant way. His works are also known for being filled with sexual double-entendre, dirty jokes, and bawdy songs that can still surprise or even shock modern readers. Rabelais has attracted many modern writers and scholars. One of the most notable was English mystic, Aleister Crowley. Rabelais was also a major reference point for a few main characters (University Professors and Assistant) in Robertson Davies's novel The Rebel Angels, part of the The Cornish Trilogy. His works are the focus of the main character, Maria Theotoky's Ph.D. thesis. Milan Kundera, in an article of January 8, 2007, in The New Yorker, said: "(Rabelais) is, along with Cervantes, the founder of an entire art, the art of the novel" (page 31). He speaks in the highest terms of Rabelais, calling him "the best," along with Flaubert. American Pragmatist philosopher C.S. Peirce writes in his 1908 article, "A Neglected Argument for the Reality of God:" "I can testify that the last half-century, at least, has never lacked tribes of Sir Oracles, colporting brocards to bar off one or another roadway of inquiry; and a Rabelais would be needed to bring out all the fun that has been packed in their airs of infallibility." Author D.H. Lawrence refers in Lady Chatterley's Lover to a central character: "That our estimable gamekeeper should have about him a touch of Rabelais seems to make him more monstrous and shocking than a murderer like Crippen." Forflex.se. Alex Online. Retrieved October 24, 2007. Lee, Jae Num. "Scatology in Continental Satirical Writings from Aristophanes to Rabelais" and "English Scatological Writings from Skelton to Pope." Swift and Scatological Satire. Albuquerque: University of New Mexico, 1971. 7-22; 23-53. Thelemapedia.org. François Rabelais. Retrieved October 24, 2007. The Order of Thelemic Knights. Rabelais: The First Thelemite. Retrieved October 24, 2007. All links retrieved May 9, 2017. This page was last modified on 9 May 2017, at 15:13.